This month, the Crazy Cooking Challenge is to make mashed potatoes. I think my recipe is awesome (of course), but doing the usual, I entered the term into Google, chose pages from South Africa, and came up with a recipe from Real Men Can Cook. The recipe is written just like I imagine Fritz would speak. I decided to make lamb shanks for Dave’s birthday for the competition running on yuppiechef. Jamie Oliver suggests a celeriac and potato mash to go with it. But, celeriac is not in season in South Africa. I chose to use this recipe for the mash. I would definitely try it again with the baking powder, but I would use my ricer as I prefer not mashing them with a hand held masher. Please see the Secret Santa post! Hi! I like that you have the lamb shank on top of the mashed potatoes. I think you’re the only one to have styled it with meat, which is what mashed potatoes needs. Lovely! I thought everyone uses baking powder, that’s how my mom makes it so I thought that’s just the way it is! I’d imagine it helps make the mash lighter and fluffier. The lamb shank looks delish! Cool, I still need to get me a ricer! put it on your Christmas wish list! My Mom also always used baking powder in her mash potatoes and I also want a ricer!!! Lovely piece of meat!! Stopping by from the CCC (#65) to check out your recipe. Looks incredibly good. A manly meal for sure. I need a ricer. I’ve never used one but hear such good things about them. This looks so good, your picture makes me want mashed potato with gravy so much. The baking powder addition is interesting, I will have to try this next time, thanks! 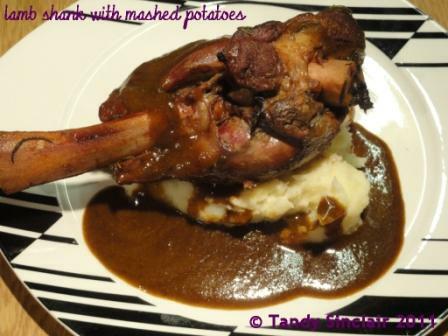 Mashed potatoes and lamb shanks has to be up there as one of my top 10 meals! And am going to give the baking powder a go too…sounds interesting and am curious now. Recipes for mashed potatoes! Interesting, because that is one of the few dishes that I make that has no recipe – and I never thought anyone would need/want one! Seriously, though, I like to whip my potatoes with carrots. I boil or steam them together until both are fork tender. Season and whip them together with some butter and fat-free sour cream. Since the FF sour cream is much thinner and more “liquidy” than the regular, there is no need to add any other liquid. They are pretty, and delicious, and it’s a great way to get kids to eat other veggies – even my carrot-hating son likes these potatoes! Baking powder? Never heard of adding that to spuds. Very interesting. They look delicious! I too will try the baking powder next time. I’m curious to see what happens. Like a lot of others, I’ve not heard of baking powder in the mashed potatoes either. Did he have a lovely birthday? Tandy, the mashed potatoes look delicious. I like mashed potatoes with cream and butter too. Never heard of adding baking powder to mashed potatoes. Your potatoes look very good, my real man would just love them. Great recipe for the Crazy Cooking Challenge, it looks delicious! Hope you are having a great day. This recipe looks fabulous! I never saw the addition of baking powder in mashed potatoes before so now I am intrigued! oo yum!!! Great Choice for THE CRAZY COOKING CHALLENGE!! Tandy, yum! Lunch time is the worst time to be commenting on all these amazing mashed potatoes (one of my favorite foods!) and that Lamb Shank looks SO good! Yum, the simpler the better. These are spot on! I am also curious about the baking powder. The recipe sounds so interesting, I will be trying it.Thanks! Sounds delicious and I too wonder what the addition of baking powder does. Hmmm? I would never have thought of adding baking powder! I wonder what part it plays? Yum. I’m going to have to try adding baking powder–sounds interesting! Hmm, I have never added baking powder to my mash before – will give it a go next time around.